I spent the last five years doing a PhD in nutrition with a goal to understand how diet can prevent disease. One thing I realized during this degree is that the most efficient way to prevent disease is to nourish optimally during the first 1000 days of life—a time when breast milk is the most important source of nutrition. Unfortunately, too many women can’t breastfeed, or choose not to, or have circumstances that prevent it. What I’ve learned is that technological innovation cannot fix this problem. Even if formula companies created a powder that perfectly matched the composition of breast milk, it wouldn’t matter. That’s because the nourishment an infant receives when it breastfeeds is only partially due to the physical constituents of the milk itself. Studies have shown that skin-to-skin contact…the touch between the mother and her child is the key. Touch is what enables the mother to produce the specific antibodies for the germs her baby has been exposed to. Touch is what enables optimal development of the baby’s jaw, teeth and facial structure. And most importantly, touch stimulates greater oxytocin release in the mother which makes her more confident, improves her mood, lessens her stress, strengthens her bond with her child and increases her desire to care for her baby. Therefore, innovation in formula technologies won’t fix the health issues that stem from the earliest days of life. Because the preventative health benefits of breastfeeding are as much due to touch as they are to nutrition. Since Ancient Rome they’ve been prescribed for upset stomach, and today they’re clinically proven to treat numerous digestive issues. They can prevent allergies in infants, and have even been linked with decreased risk for anxiety and depression…wondering what I’m talking about? PROBIOTICS, of course! First, because of…let’s just call it my restricted dairy intake…I got excited about the idea of drinking Kombucha tea. Kombucha tea is an ancient beverage that has become somewhat of a health fad these days. Initially, I thought I could buy Kombucha tea at my local specialty tea store. And while they do sell Kombucha tea leaves, this isn’t the real deal, as it’s impossible for dry tea leaves to contain probiotics, because outside of a cool environment, probiotics die. While there are some “spore” varieties that will supposedly hatch after being heated, I couldn’t find any of those on stores shelves. As for making Kombucha tea from scratch…it would definitely be a “dairy-less” way to get probiotics, however, without being able to verify which strains are in the starter culture, I wasn’t too eager to invest my time. Plus, I read too many case reports of people getting sick from “suspicious” starter culture. Hence, I decided to keep searching for another probiotic food choice. There’s always yogurt, of course. But after some reading I realized that nearly all of the “big name” commercial probiotic yogurt brands only contain one or two specific strains, and none of them carried the strains that seemed to me to be the most beneficial, namely L. casei and L. rhamnosus. Then I came across Kefir. 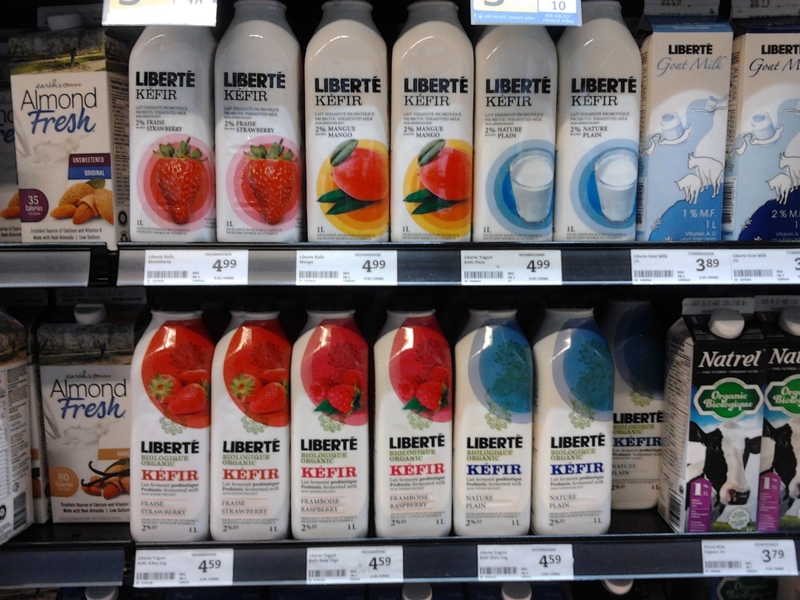 Kefir has been called the “champagne of probiotic milk beverages” and has been around since ancient times. Kefir is fermented milk, so it’s basically just like yogurt except it’s a little more “liquedy”. But more importantly, unlike many probiotics yogurts, Kefir contains ten different strains of probiotics, including the two I was looking for! So I bought it! And I tried it! I didn’t notice any immediate changes in how I felt, but coincidentally after I started drinking it someone told me that I looked different and specifically asked me if I had changed my probiotics routine! It was quite a shocking coincidence! But then I sat down with a friend of mine, Richard You-Wu, an MD-PhD candidate who specializes in gastrointestinal health. He set me straight on some probiotic facts that initially changed how I felt about them. First, while I thought that more strains meant more benefits, Richard said, “it’s not as simple as saying that more is better or diversity is better.” As a matter of fact, he explained that some probiotics can antagonize others, meaning mediocre probiotic strains may out-compete healthier probiotic strains. So with a mixed bag, there’s no guarantee that you’ll get a sufficient quantity of the kind you’re looking for. The other thing that sold me on Kefir is that each half cup contain two billion probiotics, which is often the amount used in scientific studies. Interestingly, Richard explained that we don’t know enough about dosage. He even commented that no one even knows why we use the current dosages we use; they were just randomly picked at some point. I don’t know about you, but after hearing this, I think the future of probiotics looks bright! That’s right, according to Plato “there ought to be no other secondary task to hinder the work of supplying the body with its proper exercise and nourishment”. While Plato cites olive oil as being helpful, it seems the ancient Greeks were more interested in putting it on their skin, as opposed to actually eating it. Furthermore, as would be expected, Plato warned against excessive drinking, and confectionaries (which in his day consisted of pastries and pancakes with grape syrup), describing these foods as being harmful to the body. All in all, Plato emphasized that despite our limitless desire for food and drink, self-restraint is essential for healthy living. I learned about this fact from: Skiadas PK and Lascaratos JG. Dietetics in ancient Greek philosophy: Plato’s concepts of healthy diet. European Journal of Clinical Nutrition, 2001;55:532-537.